You have just arrived at our selection of intelligent 6th-grade riddles. If you are an educator or parent and are trying to find interesting puzzles for middle schoolers, search no more! Throughout this selection are many brain teasers that will test the reading comprehension and mental acuity of your pupils. As you may know, besides being useful for stimulation of the mind, riddles also encourage kids to engage in classroom conversations and tend to help them remain focused in class. To all of the 6th-graders visiting this site, you are more than welcome here. Please solve as many of these as you can, and share them with friends and family. We hope you enjoy! Check out the many other sections of this site for even more entertaining riddles to solve with answers. Who earns a living driving their customers away? Did you hear about the actor who fell through the floor? It was just a stage he was going through! When did Anakin's Jedi masters know he was leaning towards the dark side? I am a home for royalty. There are many of me in England. I am made of stone. I am protected by a ring of water. I'm found in many legends. This thing was here since the world began yet it is never more than one month old. What is It? Draw me, fire me or fill me in. I am a longing gaze or slightly confused stare. What might I be? What force and strength can not get through, I with a gentle touch can do, and many in the streets would stand, were I not as a friend in hand. Wednesday, Tom and Joe went to a restaurant and ate dinner. When they were done they paid for the food and left. But Tom and Joe didn't pay for the food. Who did? 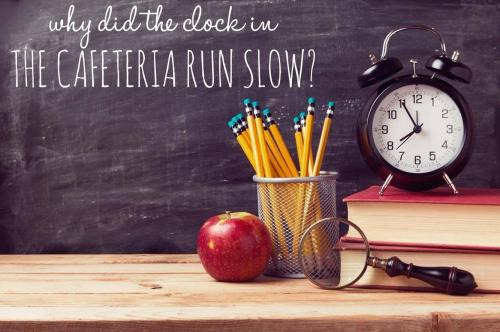 Why did the clock in the cafeteria run slow? It always went back four seconds! Can you come up with a cool, funny or clever 6th Grade Riddles of your own? Post it below (without the answer) to see if you can stump our users.